Kati Arikoski’s story begins with a childhood interest in both music and boxing. These activities have given her life direction, leading to her profession as a pianist. While one would think there are only differences between boxing and music, Kati will tell of the similarities of focus, flow, and energy between them. She will explain the importance of, intuition, self-confidence, and fighting for what you want. 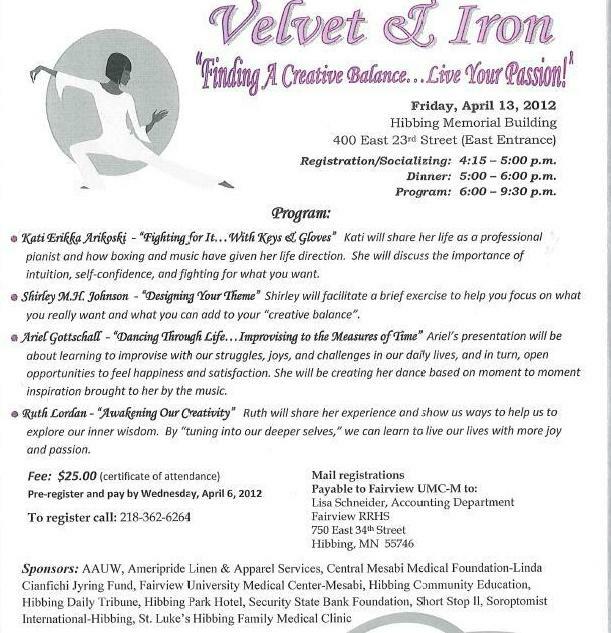 In 1994 the “Velvet & iron” Women’s conference was created by three women: Jana Bell, represented the Central Mesabi Medical Foundation, Mary McCauley of the Hibbing Community College and Shirley Johnson of the Fairview Employee HELP System. They wanted women to have the opportunity to attend a local wellness event that would be educational, inspirational, and give them an opportunity to socialize and have fun. Empowering women through knowledge and support continues to be a focus. Since that time the conference has continued to be annual event and is sponsored by many community organizations.